Certain sounds can take you back to a different time and place. Any time someone says the word “fight” in a deep voice, I’m immediately transported to a dingy room at the local video game parlour, playing Mortal Kombat 2. As with most things, such sounds have a home on the Internet. In some nook or corner, you can find the perfect ding of a game you love, a short dialogue from your favourite geeky movies 42 of the Best Geek Movies of All Time: How Many Have You Seen? Geeks are people too. I am one, you’re probably one, and we’re a growing army that can no longer be ignored. Not even by Hollywood. Geek movies FTW! Read More , the ignition sequence from NASA, and much more. A long time ago, we showed you 10 sites to download famous movie quotes 10 Websites For Famous Movie Quotes Read More . Sadly, most of those have died or are no longer updated regularly. That’s not a problem with Movie Sounds, where you can download a quote from 2014’s Interstellar or from 1975’s Dog Day Afternoon. 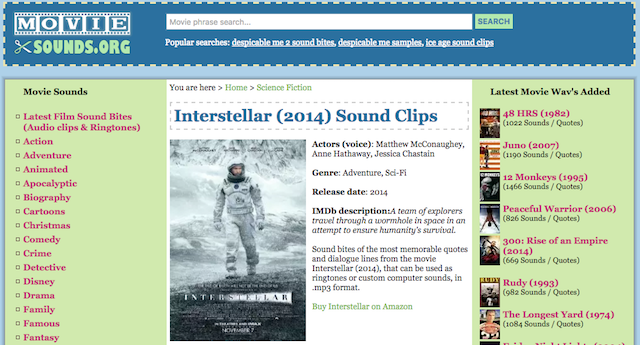 The big search bar at the top lets you search for a phrase quickly, or you can just search for the movie’s name. The highest rated quotes show up first. There’s a full transcript of a quote, and you can preview the audio before you decide to download it. Click a quote to download it, and also get the context in which it was said in the movie. The downloads are usually MP3s sampled at 128 kbps. You’ve probably read countless times about the Apollo 11 mission, and you can even learn about the moon landing on the web Learn About Neil Armstrong & The Apollo 11 Moon Landing On The Web Neil Armstrong passed away on Aug. 25, 2012, after a life filled with magnificent achievements. Sadly, his death prompted many people across the InterWebs, particularly on social media sites, to ask, Who was Neil Armstrong,… Read More , but it’s all just a build-up to hearing Neil Armstrong say those immortal words, “One small step for man, one giant leap for mankind.” Well, those and several other audio files from decades of NASA missions are now available for free download. 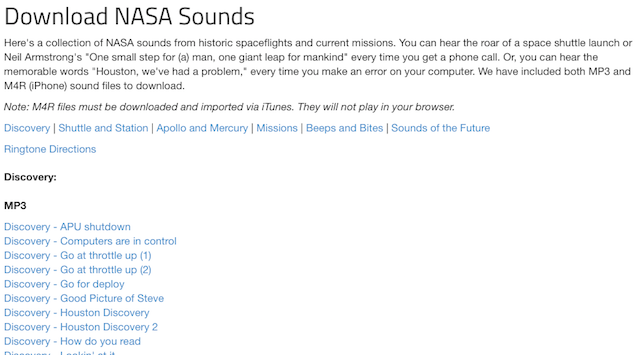 The NASA Sounds archive is categorized into Discovery, Shuttle and Station, Apollo and Mercury, Missions, Beeps and Bites, and Sounds of the Future. Each item is labelled clearly so you know what to click, and available in MP3 or M4R file formats. The MP3 files can be previewed in your web browser, but the M4R files will only work in iPhones and iPods through iTunes. Houston, we no longer have a problem, at least to get the space sounds we want. Startup founders, especially those from Silicon Valley, often make an appearance on the various tech podcasts geeks should listen to The 20 Best Podcasts of 2015: As Recommended by MakeUseOf Have you ever wondered what your favorite MakeUseOf authors listen to when they want to learn something new, hear a good story, or simply be entertained? This article means you need wonder no more. Read More . But how do you find your favorite founder’s advice from the different resources? And what about when you want advice from different founders on a particular topic? That’s where Parcel comes in. 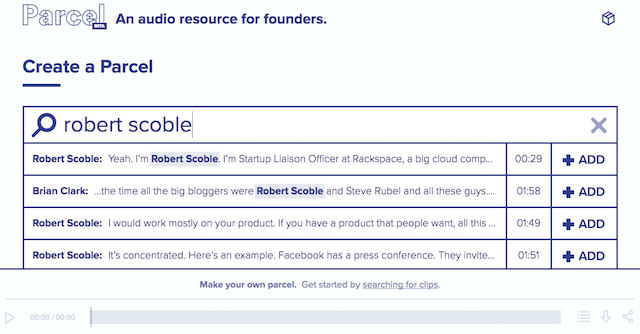 Search for a personality, a company, or a topic, and you’ll get a list of all the clips stored in Parcel’s database of podcast appearances — complete with a transcript. You can preview search results, and add the ones you like to your custom “parcel”. The created parcel can then be downloaded or shared for free. If you like the idea of this, you really should sign up for Parcel’s newsletter to get recommended parcels delivered to your inbox regularly. Everyone has their own opinion about what constitutes the must-watch geeky TV shows Geek TV: 18 of the Best Television Shows for Geeks There have been countless geeky television shows produced over the years, but which are the absolute best every self-respecting geek should have watched by now? Read More or movies. But that’s not to say a show has to have something about technology or science for geeks to enjoy it. The Sound Archive is one such eclectic collection of audio samples from popular culture that few geeks could resist. Here’s the current roster of what’s on offer: Archer, Star Wars, South Park, The Simpsons, Beavis and Butthead, Napoleon Dynamite, Ace Ventura, Caddy Shack Monty Python, Talladega Nights, Austin Powers, The Hangover, Space Balls, Something About Mary, Tommy Boy, Flight of the Conchords. Each movie or show has plenty of audio files from their best moments, and there are also two other collections for quotes related to emails and audio that will fit best for ringtones. It’s surprisingly difficult to find a good collection of video game sounds that you can search, preview, and download with ease. Retro game sounds are perfect for ringtones Make Your Ringtone Awesome With Retro Video Game Sounds If you’re still using the generic ringtone that came with your phone, it’s time for a change. 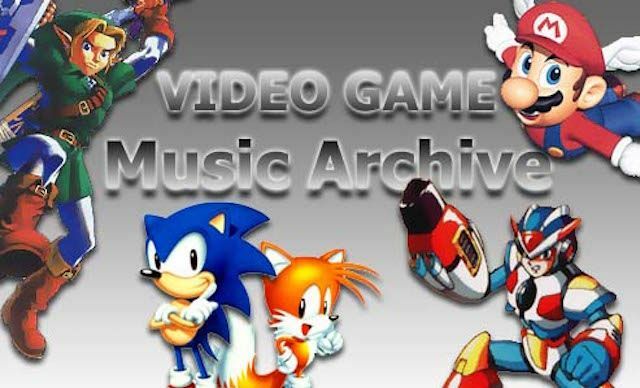 Why not use some classic video game music an awesome new ringtone? Read More , but finding the right ones are proving to be more difficult than anything. What this means is that an old favorite, VGMusic is your only real option right now. But even that site is difficult to browse, only has MIDI files, and is quite outdated. Instead, to get the right video game sounds, you should search for it on YouTube or SoundCloud and download it as an MP3 from MP3Fiber. More often than not, you’ll find the right audio effect. And just in case you have a bigger clip than you wanted, chop it up with MP3Cut or other tools to split music files The Top 5 Free Tools to Split or Merge Music Files Read More . Let’s get inspired a bit and share what we use as our ringtones. Personally, I made an MP3 out of Pomplamoose’s cover of the Angry Birds theme. Check it out and use the aforementioned MP3Fiber to download it to your smartphone.